To understand how British people perceive the events on the globe, one can look at how frequently a country has been mentioned in major news stories. The following map does exactly this by visualising the number of news items on the website of the British Newspaper The Guardian (data derived from their Data store). One nation of the world, we noted, was a bit enlarged, owing to the fact that stories tagged “Israel” represented the 5th highest country in the Guardian for 2010 (1,008 stories in all). 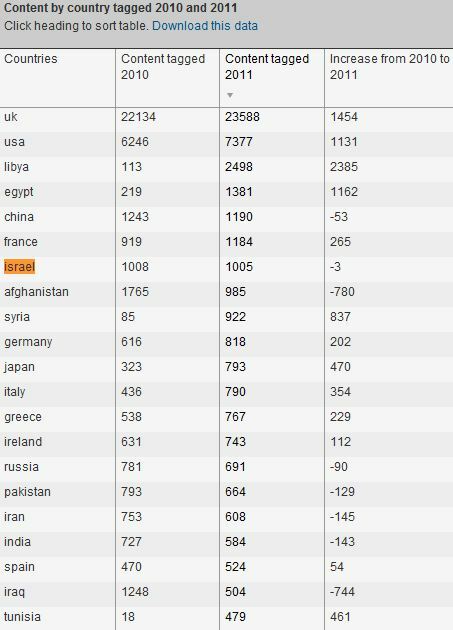 Well, the newest results for such country tags have just been reported by the Guardian, and, in 2011, Israel again was the continuing object of their obsession, coming in 6th (1,005 stories in all). Here is a partial snapshot of their list, noting the top 21 nations by tags. Even further down on the list are country’s you’d expect to receive more coverage: Turkey (326 tags), Sudan (173 tags), Bahrain (348 tags, despite an uprising against the government which resulted in many dead and several thousand arrests). Further, as we noted in last year’s post, Israel is a nation of 7.8 million citizens, representing a little over 1/10 of 1% of the world population, and is situated on roughly 21,00 square kilometers of land which represents a bit over 1/100 of 1% of the world’s total. Of course, the Guardian isn’t the only media group which devotes such disproportionate coverage to Israel. However, as the institution represents the most hostile anti-Zionist voice in the Anglo world, at least, among widely read publications (with the possible exception of Al Jazeera), their malign obsession continues to represent a serious front in the cognitive war against the Jewish state. Yes but look on the bright side. Three fewer stories this year. In another 100 years the Guardian might actually have more stories about backwaters like, say, Germany and Russia. Oh but I forget. In another 100 years the Guardian will be financially well and truly bankrupt (morally, it is already). In that case, I can only hope that I live to be 144! Of course the stats for “Israel” in fact relate to Israel/Palestine. Imagine the headlines: Guardian-wipes-Palestine-off-the-map shocker! Help! The Guardian stole my Palestine! Well, its nice to know that the nerd at the Guardian who put this table together does not recognize “Palestine” as a country. Perhaps next year the Arabs should demand that the table be prepared in Iceland by a parliamentary committee. Is it conceivable that the G doesn’t tag its stories for “Palestine”? So why isn’t it in the list? Is it possibly because they’d be too embarrassed to admit to running 1000 stories on Palestine (in a year where nothing happened there)? There is no country “Palestine”–a bunch of nomadic Arabs relatively newly arrived in what has been historical Eretz Israel, and now suddenly since Israel is firmly in control of their historical homeland, of course the Arabs and their antiSemitic friends are trying to claim that “Palestine” is a country. Amazing isn’t it that there was no claim about “Palestine” from these types when Jordan controlled the Judea and Samaria–what an obvious fraud! What’s frightening here is that it was a relatively quiet year, as far as Israel was concerned. No wars, no intifadas, no major terror attacks, if you disregard the occasional rocket barrage. I wonder if journalists who get sent out have reporting quotas they have to fill each year. 1000 stories / year two years in a row probably isn’t an accident. Think about that, 2.7 stories every single day! Wow! Is Israel important enough for the British public to justify 2.7 stories every day?! Victor, this is a key issue. The Guardian maintains the idiotic Harriet Sherwood in Jerusalem, and either requires her to write frequent columns about anything at all that deals with Israel to keep the anti-Israeli obsessives (and even the pro-Israeli obsessives) happy and adding clicks to impress the advertisers, or she feels she must to justify her existence and remain employed. Now they’ve added Phoebe Greenwood – the same issues apply. A country like, for example, Uzbekistan, where there is no permanent staff, will get less coverage. In other words, if the Guardian (and many other media outlets) removed their staff from Jerusalem, the coverage of Israel would begin to approach the normal amount for tiny country not experiencing any major conflict (though I think 600+ missiles in a years elsewhere would draw attention) and of no great importance in world affairs at this time. Do you really expect international correspondents to stay in Damascus or Amman rather than Tel Aviv? They vote with their feet, and so their behaviour gives the lie to all their anti-Israeli propaganda. Simon Jenkins has a column that is sophomoric even by Guardian standards. Jenkins, who writes in a style that is dryer than dust, is not an easy writer to read. By paragraph 2 of a Jenkins column, you are usually so bored that it’s hard to plow through the rest. Today, Jenkins is writing his umpteenth “Israel lobby” column. This time, Jenkins writes lovingly of the Iranian government. It is peaceful, calm and has no hostility to the West. As for human rights violations by the Iranian government, Jenkins is unaware of any such things. Instead, he say the “Israel lobby” (Jenkins doesn’t have guts to say “The Jews”, which is what he always means) controls the British defense ministry and foreign ministry in the UK and also controls the United States Congress and President Barack Obama. Can you or any of the four people recommending this post reveal where this Jenkins article can be found – in which (according to you) he says the Jews control the British defense ministry? of this large number of articles about Israel is negative. That statistic would i’m sure highlight more clearly the Guardian’s obvious and highly offensive and relentless racism toward Israel. Then that number could be publicized, circulated, etc., to shine the type of unflattering light on bigots @ the Guardian that they richly deserve. You’re right. We need to be specific. Is it 100% or anly 98%? 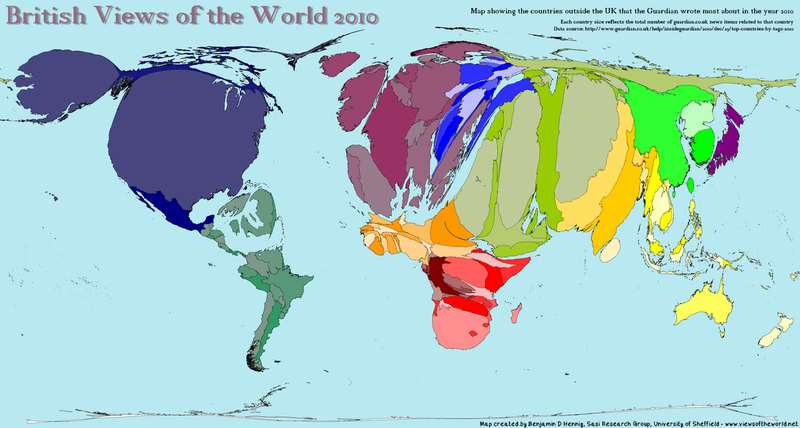 Is the 2010 map correct? Iran shows larger than Israel despite that there are more stories on Israel than Iran in 2010. But what you all have to understand is that even if Israel (GDP $245 billion) gets far more stories than Germany (GDP $3.6 TRILLION), it’s the former that secretly RUNS THE WORLD. What do you mean “secretly”?!?!?!?! Wasn’t Pakistan created by the UN as an independent nation-state in 1947? Doesn’t Pakistan have it’s own bloody war and battle over “disputed territory” (Kashmir)? Doesn’t Pakistan have its own nuclear arsenal, and aren’t they the country that housed Osama bin Laden (or at least his sympathetic body double) for the past 5+ years?